ANTRIM made a winning start to their 2016 National Football League Division Four campaign with a well-earned 1-12 to 0-10 win over Carlow at Dr Cullen Park. 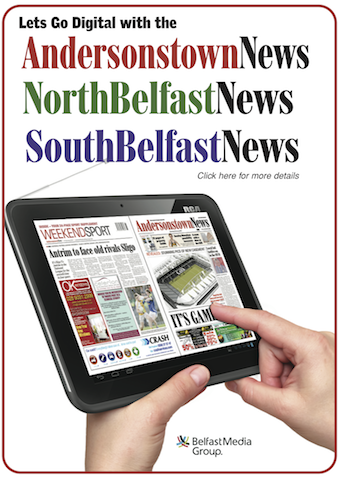 Apart from a nervy 10-minute spell towards the end of the game, Antrim always looked the more likely winners as Kevin Niblock’s first half goal helped the Saffrons claim both points. On the downside, the game’s only goal-scorer was forced to retire midway through the second half with a dead leg and is a major injury concern for this Sunday’s round two clash with Wexford in Corrigan Park. Speaking after the game Antrim joint-manager Frank Fitzsimons expressed his satisfaction with the result, if not the performance. “We knew coming down here that it was going to be tough,” said Fitzsimons. “We played some good football but there were stages of the second half that we wouldn’t be happy with our play. Both sides also ended the game with 14 men after Niall McKeever and Carlow midfielder Brendan Murphy were shown second yellows after an off-the-ball clash. Despite playing against a strong breeze, Antrim landed the opening two scores with Matthew Fitzpatrick and Michael McCann finding the target. 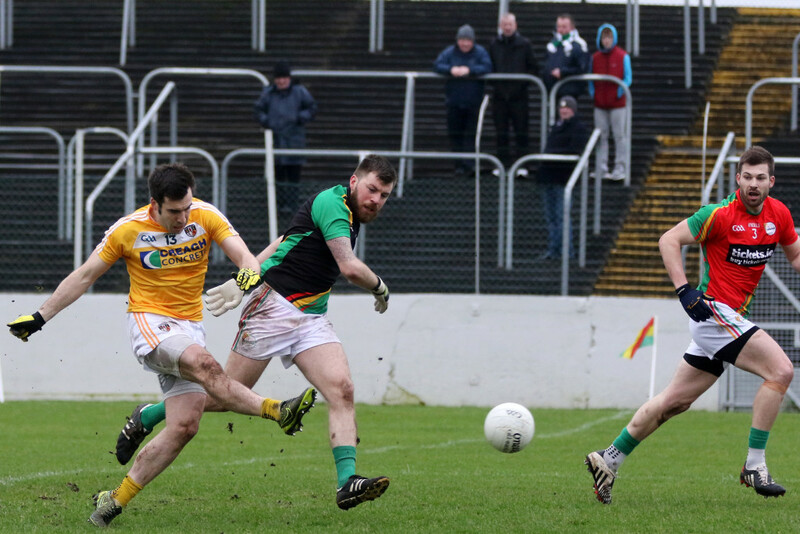 A brace of Paul Broderick points and a fine score from centre half-back Derek Hayden gave Carlow the lead before Antrim hit back with what proved to be the game’s only goal. A quick counter-attack allowed Antrim to catch Carlow on the hop and James Laverty’s pass found Niblock in space. The Saffron skipper won possession against Hayden before rounding Carlow goalkeeper Craig Kearney and slotting the ball into the net. Worse was to follow for the home side as key marksman Broderick was forced to retire just before half-time. Leading 1-4 to 0-5 at the break, Antrim hit five unanswered points early in the half with McCann (two), Niblock, James Laverty and Conor Murray all scoring from play. Niblock was forced to retire from the game midway through the second half after taking a huge hit and Carlow got themselves back in contention with fine points from John Murphy, Brendan Murphy and two Darragh Foley frees. With three points between the sides, JJ Smith thought he had tied the game but his goal was correctly disallowed for a square ball infringement – although referee Patrick McGuire had blown his whistle before Smith got his shot away. Late points from Murray and Paddy McAleer finally ended Carlow’s challenge with Antrim’s tally of 1-12 all coming from open play.